I’ve been following the fallout from this G20 summit through Twitter, YouTube and other media over the past few days. I wasn’t there myself, but I have some experience as an observer during protests, so a lot of what I saw and heard was familiar. The first thing you have to know about large protests – and the police action that comes with it – is that it’s all more of a public relations war than anything else. Neither side is interested in harming the other (permanently), nor do they seriously expect that the other side will listen to reason and compromise. Instead, their shared goal is to convince the court of public opinion that the opposing side is an evil, heartless monster menace and they are the innocent victims (it’s a battle the police tend to win, by the way – as a post-G20 poll shows). And that wouldn’t be so difficult. All either side has to do to get on the public’s good side is behave. Don’t antagonize, don’t attack, don’t resist, don’t break the law. The problem with large protests (just about anything large enough to bring out the riot squad) is that while the majority – even the vast majority – do behave during these events, a minority of both sides doesn’t. And those are the ones people focus on. The ones who let their frustrations get the better of them, the ones who think the ends justify the means, or the ones who are just straight-up assholes. And so, in the days after the G20, both sides have been screaming out half-truths to anyone who will listen, trying their best to exaggerate the extreme actions of the other side while dismissing or rationalizing their own excesses. Here are a few of those outrageous claims. Some might be true, others not. I don’t know, because it seems everyone who does know the truth is too clouded by their political agendas to speak it properly. But I’m willing to guess the truth lies somewhere between the two sides. LCN has picked up the scent of findesamendes.com, a website that seeks to help drivers with speeding tickets by letting them know where radar traps are. If that sounds familiar, it’s similar to a service being offered by SOS Ticket, which I wrote about in January. Both are perfectly legal, though the fact that they’re undermining police efforts, and they’re not all that effective in their task, do raise some eyebrows. It’s also unclear how findesamendes.com plans to support itself financially if it’s not asking for any money from users. But hey, anything to help reckless speeders. On my way home tonight from work, my bus was detoured off of Ste. Catherine Street around my transfer point. Having a few minutes to wait for my connection, I wandered back to the corner of Ste. Catherine and St. Denis to see what happened. I figured from the overturned phone booth and broken glass that there had been some vandalism. Near as I can tell, the police car (marked “media relations”) was driving down St. Denis Ste. Catherine, while a passenger car was driving on Ste. Catherine St. Denis. The police car broadsided the passenger car, sending it into the southeast corner where it took out the traffic light/lamppost and phone booth, spreading glass everywhere. Fortunately, it didn’t look as though anyone was seriously hurt. 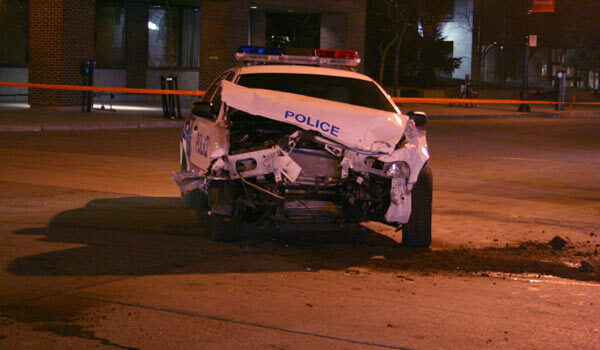 The front end of the police car absorbed much of the force of the impact as it was designed to do. TWIM: Are speeding tickets a government conspiracy? This week’s Justify Your Existence is Alfredo Munoz of S.O.S. Ticket. You’ll recall earlier this month there was some dust kicked up at a new service from this ticket-fighting brigade setup by a former police officer. That service alerts drivers to radar speed traps, so they can slow down and not get a ticket. Alerts are given to drivers by text message on their cellphones. Doesn’t that encourage dangerous cellphone use while driving? We can walk and chew gum at the same time. It takes a second to read, and you can hold the cellphone in front of you as you read it, to keep your eyes on the road. It doesn’t worry me. We’ve studied this. Ads on the side of the road or drinking a coffee are more of a distraction than a text message. I talked with Munoz last week in the small company’s log-cabin-like offices in Old Montreal, around the corner from the municipal courthouse. He sat me down on his expensive-looking leather couch and we talked for a while about the ethics of his service and tickets in general. Munoz sees S.O.S. Ticket as the only true force representing regular car drivers. He philosophizes that nobody has ever changed the world by being liked by everyone. Whether he does more good than harm is something for you to decide. S.O.S. Ticket, the service setup by former Montreal police officer Alfredo Munioz to help people defend traffic tickets, has launched a new service. For 50 cents per message, drivers can subscribe to a radar trap alert service, which will notify them by text message when and where police officers are checking people for speeding. The service says they find this out through the use of “road agents” (spies) who look around for them and report them. Aside from the inherent problems essentially keeping track of every police car in the city and every SQ vehicle on the highway, there are serious ethical implications as well. Defending people in court is one thing. Helping them to (essentially) avoid police while committing a road infraction seems a bit more serious. Not to mention that it encourages people to speed. Playing the Bianca Leduc card with little shame, western off-island mayors want the Quebec government to give them the power to give private security firms the power to hand out tickets for moving violations (such as speeding). They say the SQ is insufficient at the job, partially because their officers are paid so damn much. Currently, with two notable exceptions, only police officers (municipal police, SQ or otherwise) can hand out legally-enforceable tickets to people. The two exceptions are Stationnement de Montréal (the green onions), who hand out parking tickets (but cannot ticket motorists for moving violations like going through a red light or making a wrong turn), and private security inspectors who patrol the public transit system (like the inspectors AMT hires to check proof of purchase on commuter trains), who can ticket for failing to pay a fare or other minor violations. In neither case are the agents armed, and they cannot make arrests or otherwise forcibly confine citizens. What the mayors want is a system more like we see in the U.S., in which private companies have a limited role in law enforcement, and their actions are under constant scrutiny (to the point of having video cameras record alleged infringements). Pincourt Mayor Michel Kandyba said he doesn’t agree with the other mayors that it’s a good idea to create a new category of unarmed agents to issue tickets for moving violations. More SQ officers doing more Highway Code enforcement is the better way to go, he said. I think his point is very important, not because I think people are going to pull guns on these unarmed enforcement agents, but because being a police officer is more than just putting on a uniform with a big belt. There’s a reason that SQ officers are paid more than these glorified bouncers that work for private security firms, and that reason makes them much more qualified to handle the high stress situations that will arise when you stop someone for speeding. Another reason I have reservations about this idea is because of the inequities it creates. Cities with big budgets and rich property owners will be able to afford better security. And then what’s next? Their own private court system? Private hospitals? Will their citizens get a discount on tickets compared to visitors from out of town? 2-for-1 deals? Maybe I’m just being paranoid and silly. But can SQ officers just be replaced on the roads of Quebec’s small towns with private security officers who are paid half as much?